China raised bar COO - ROTJ 79A Back. Stormtrooper MOC. All still factory sealed/unopened. Card is unpunched and lies flat. Minimal surface wear on the card back. Bubble does not have any holes or cracks, and is in lovely condition, just a slight ding in top right. We also sponsor a local youth football team. Champion dreams limited. United Kingdom. Three Legged Cross. Need Help ?. Item Price: £11.99. New listingStar Wars Vintage 1984 LUKE STORMTROOPER LAST 17 COMPLETE !! Hi this is an auction for Luke stormtrooper complete with blaster float tested and helmet. The figure is slightly off white. With a little paint wear to hands. See photos. No returns. Stiff limbs nice example of a hard to find figure. PayPal only Uk bidders. Please don’t bid if you are unsure. What you see is what you get. STAR WARS GENUINE WEAPON STORMTROOPER. In excellent condition, from pet and smoke free house. Star Wars Stormtrooper 1/4 scale 18" figure. Condition is Used. Dispatched with Royal Mail 2nd Class. Not displayed out of my personal collection. Item: 1977-85 Kenner: Star Wars - JOB LOT (Stormtroopers). Condition: Used. Overall fair condition. Star Wars Saga Collection George Lucas Stormtrooper with shipper . Excellent condition including the white shipping box. Thanks for looking please checkout my other items. Vintage Star Wars Stormtrooper. Condition is Used. Dispatched with Royal Mail 2nd Class. STAR WARS GENUINE WEAPON AND SKIRT NO REPRO. Kenner Star Wars. Death Star Droid 21 Back Re Carded Condition is New. Ending 22 Apr at 10:10AM BST10h 34mTheme: Star Wars VI: Return of the JediBrand: KennerSize: 3.75"
Brand new and ready for action. Made by hasbro in 2008. Free postage. Thanks for looking. E bay has Global services to help shipping outside the UK, I only post in the UK. Kenner Star Wars (POTF). 92 Back Re Carded Condition is New. Type: Action FigurePackaging: Original (Opened)Size: 3.75"
HASBRO STAR WARS 30TH ANNIVERSARY CONCEPT STORMTROOPER 2007 FIGURE W/ COIN. Condition is Used. Dispatched with Royal Mail Signed For® 2nd Class. Saga Legends Stormtrooper 2013. to see the condition yourself. Salacious Crumb. Kenner Star Wars (POTF). SANDTROOPER STORMTROOPER . Range - Star Wars 1995 Power ofthe Force onwards. Theme: Star Wars: Power of the Force (1995)Year: 1995Size: 3.75"
Star Wars Black Series 40th Anniversary Stormtrooper Figure New. Case fresh. Condition is New. Dispatched with Royal Mail 2nd Class. Please do look at my other Star Wars items for sale. Luke Skywalker (Dagobah) 41 Back Re Carded Condition is New. Kenner Star Wars (ESB). Star Wars FN-2187 POP Vinyl - 100. Box in good condition. Kenner Star Wars Grand Moff Tarkin 12 Back Re Carded Condition is New. Dispatched with Royal Mail 2nd Class. Near Mint Repro figure with weapon. Cards and bubbles are as close as match as Kenner back in the day. Full refund if not satisfied. 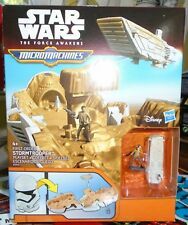 Ending 24 Apr at 9:52AM BST2d 10hTheme: Star Wars VI: Return of the JediBrand: KennerSize: 3.75"
Star Wars The Force Awakens Black Series Stormtrooper Unopened. Condition is Used. Dispatched with Royal Mail 2nd Class. Official Hasbro. In the unlikely event that you receive a faulty item, we are here to help. Why Buy From Us?.